Can You Actually Get Sick from Cold Weather? On Average, adults catch a cold about two times a year in the United States. 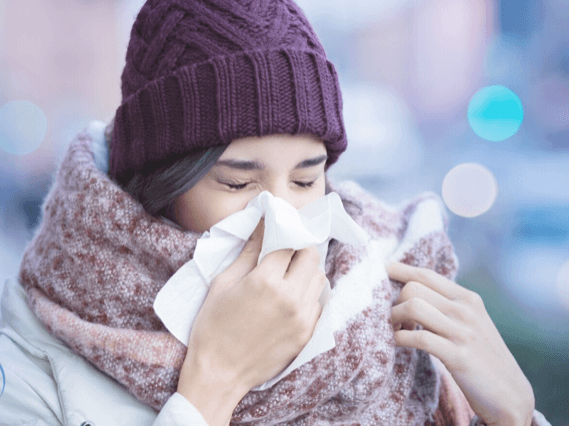 The winter season tends to bring about a higher number of people who get infected and suffer from the common cold and the flu. This pattern has caused confusion about the role temperature plays when it comes to the body and sickness. Despite its name, the common cold is not actually caused by cooler temperatures. For years we’ve been told to that when it’s cold out we need to avoid leaving the house with wet hair and exercising outside. The reality is that none of these things can actually make you catch the common cold. Cold weather related illnesses include frostbite, hypothermia, and asthma complications. Researchers have concluded that cooler weather does not actually give you a cold. Cold weather and dry air do impact the immune system, though, making it weaker and more susceptible to catching a virus. Additionally, the viruses responsible for causing cold and the flu thrive in these conditions. This, combined with spending an increased amount of time indoors where the air is dry and people may be sick, can lead to higher chances of catching a virus. The cold and the flu come from two different viruses and have slightly different symptoms. Another myth that seems to circulate around during peak cold and flu season seems to turn many people against getting a flu shot. Contrary to popular belief, getting the flu shot does not make you catch the flu. The best way to prevent the cold and flu is to wash your hands often, avoid close contact with those who are sick, eat healthy, exercise, and get quality sleep.